A riveting memoir from the Navy doctor praised as "Hero, M.D." on the cover of Newsweek. Cdr. Richard Jadick's story is one of the most extraordinary to come out of the war in Iraq. At thirty-eight, the last place the Navy doctor was expected to be was on the front lines. He was too old to be called up, but not too old to volunteer. In November 2004, with the military reeling from an acute doctor shortage, Jadick chose to accompany the First Battalion, Eighth Marine Regiment (the "1/8") to Iraq. During the Battle of Fallujah, Jadick and his team worked tirelessly and courageously around the clock to save their troops in the worst street fighting Americans had faced since Vietnam. It is estimated that without Jadick at the front, the Marines would have lost an additional thirty men. Of the hundreds of men he treated, only one died after reaching a hospital. This is the inspiring story of his decision to enter into the fray, a fascinating glimpse into wartime triage, and a compelling account of courage under fire. About the Author: Cdr. Richard Jadick is the recipient of the Bronze Star with a Combat V for valor, the only Navy doctor to have been awarded one so far in the Iraq war. He is now a urology resident at the Medical College of Georgia and is still in the Navy.Lt. Cdr. 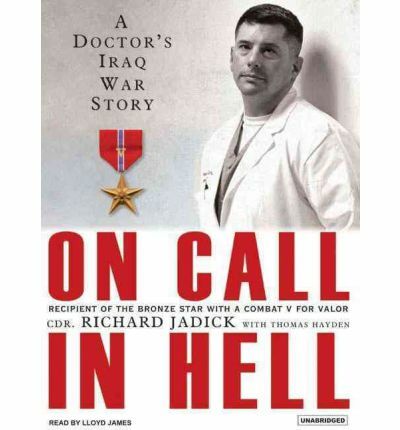 Richard Jadick is the recipient of the Bronze Star with a Combat V for valor, the only Navy doctor to have been awarded one so far in the Iraq war. He is now a urology resident at the Medical College of Georgia and is still in the Navy. Thomas Hayden is a freelance journalist. Note: This AudioBook is in mp3-CD format. This signifies it will only play on CD players especially outfitted to play mp3-CDs. It as well can be installed onto a home pc and cloned over to an assortment of mp3 players and played on them.